Free shipping. Buy direct from HP. 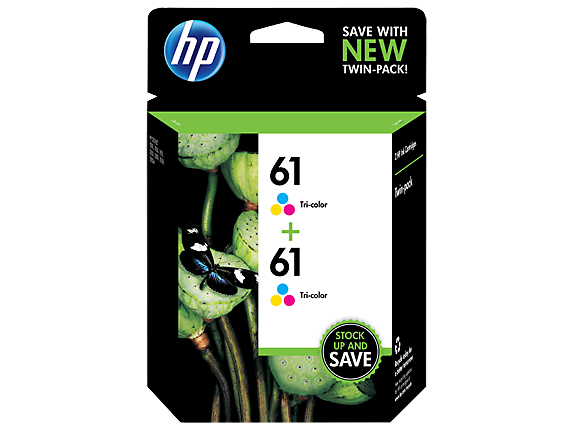 See customer reviews and comparisons for the HP 61 2-pack Tri-color Original Ink Cartridges. Upgrades and savings on select products. Get sharp black text and brilliant color images. Count on getting impressive looking documents with razor-sharp blacks and brilliant color, page after page.Store legal documents, awards, and photos that maintain readability and text and color quality. Get consistently sharp text and vivid color with everything printed—reports, documents, photos. Everything.Count on reliable performance and high-quality results in challenging environmental conditions. Get user-friendly features and a great value. Count on HP for an excellent printing experience. With HP SureSupply, it’s easy to buy Original HP Supplies from any device when you’re running low. HP 61 ink cartridges are built with recycled materials and can easily be recycled for free through HP Planet Partners. Use convenient ink alerts to easily identify and shop for Original HP cartridges using HP SureSupply. HP proprietary inks prevent corrosion and clogging of the printhead, ensuring the best prints. Count on getting impressive looking documents with razor-sharp blacks and brilliant color, page after page.Store legal documents, awards, and photos that maintain readability and text and color quality.Get consistently sharp text and vivid color with everything printed—reports, documents, photos. Everything.Count on reliable performance and high-quality results in challenging environmental conditions. Select the HP ink cartridge best for your needs. Do a lot of printing? Choose HP high-yield cartridges.It’s easy to monitor ink cartridge levels using the convenient on-screen gauge, so you never have to run out.Low ink alerts let you know if a new cartridge is needed so you can finish printing critical documents.Get up to 2 times more color printed pages, using optional high-yield cartridges. With HP SureSupply, it’s easy to buy Original HP Supplies from any device when you’re running low.HP 61 ink cartridges are built with recycled materials and can easily be recycled for free through HP Planet Partners.Use convenient ink alerts to easily identify and shop for Original HP cartridges using HP SureSupply.HP proprietary inks prevent corrosion and clogging of the printhead, ensuring the best prints. 1 See http://www.hp.com/go/printpermanence and http://www.wilhelm.research.com. 2 Program features, retailer participation, and availability may vary by country. Internet access is required and not included. For more information, visit http://www.hp.com/learn/suresupply. Not compatible with Windows® 2000. 3 HP Planet Partners availability varies. For details, see http://www.hp.com/recycle. 80% of Original HP ink cartridges contain between 45-70% recycled content. For details see http://www.hp.com/go/rerecycled content. 4 Based on HP 61XL High Yield Black and Tri-color Original Ink Cartridges. High-yield ink cartridges not included; purchase separately. For more information, see http://www.hp.com/go/learnaboutsupplies. Less cost per page compared with manufacturer recommended street price and published page yield of standard-yield HP 61 Original Ink Cartridges. Actual pricing may vary. 5 Compared with individual HP ink cartridges. Based on estimated U.S. street price. Actual retail pricing may vary.